Udupi, June 18, 2015: As per latest reports, work on third phase of Malpe port has progressed and is set to be completed. Fishing boats increased in recent years and at least 1,400 mechanised boats are berthed at first and second stage of fisheries harbour. Boats from neighbouring districts also come here and the space is inadequate. The third stage was started and is expected to reduce congestion, coming up on a 10 acres land at Baputhota in Malpe. Initially, it was decided to take up the work at an estimated cost of Rs 37.17 crore. The work was entrusted to Yojaka India Pvt Ltd on June 21, 2011. As per agreement, the work should have been completed by June 2014. Owing to various reasons, the project is delayed. Now, the revised estimate has been prepared at Rs 55.1 crore. The third phase has been taken up in accordance with the demands of fishermen. About 1,420 boats can anchor, and a rest shed for fishermen, toilets, shed for repairing boards, canteen facilities and security guard room. There was a proposal for constructing a shed to repair nets. However, as fishermen said they did not require it, it was dropped from the proposal. At present, there are over 5,000 boats including purseseine, trawler, gill net boats and over 2,000 traditional boats in Malpe. 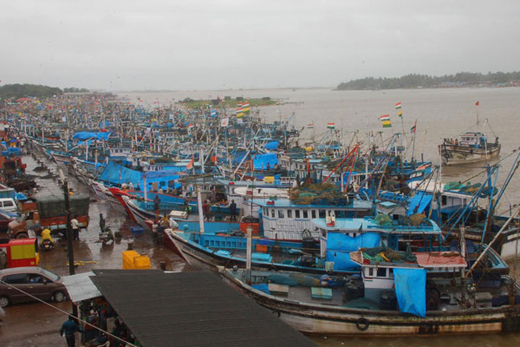 Fishermen struggle during ban on fishing to anchor their boats in Malpe. PWD (Ports & Fisheries Division) Executive Engineer told media that work on third phase is nearing completion. Once slipway is complete, third phase will be complete. Instead of taking up fourth phase of Malpe port, a port will be built at an estimated cost of Rs 20 crore in Padukere. The proposal is in process. He said a break water will be constructed at Gangolli at a cost of Rs 10 crore. Work on another break water at Koderi will be taken up at a cost of Rs 33 crore. Even before completion of work on slipway, fishermen have been allowed to anchor about 1,000 boats, he added. Mean while, a release, from the Deputy Director of the department in Dakshina Kannada reports from Mangalore, Department of Fisheries has told fishermen in coastal Karnataka to furnish bank account details to the department before June 20 to avail direct benefit transfer (DBT) of diesel subsidy. If the fishermen did not furnish the details by the cut-off date, they would not be considered for transfer of subsidy from the first fishing month — August 2015. Chief Minister Siddaramaiah had announced DBT of subsidy to fishermen in the 2015-16 budget and it had taken effect from April this year. However, a majority of fishermen opposed the scheme saying it would pave way for corruption in receiving the DBT. They were also apprehensive of delays in remitting the DBT and the paperwork involved. Finally, the government temporarily withdrew the order till the end of fishing season — June 1, 2015, with a rider that DBT would become mandatory from the beginning of the next fishing season.